Killing the worm, which is actually a caterpillar, would defeat the purpose. Caterpillars spin the cocoons that provide the filaments which comprise silk thread. 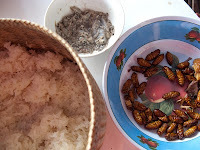 But cocoons contain pupae and, when cocoons are boiled to loosen the gum that holds the filaments together, the pupae are cooked much the same as an egg is boiled. And, just as a boiled egg will never become a chicken, a boiled pupa will never become a moth. Also like a boiled egg, a boiled pupa is an excellent source of nutrition. 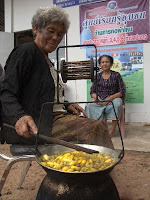 So much so that the United Nations Food and Agriculture Organization (FAO) promotes the nutrition available from silk pupae, especially in the rice-growing regions in Southeast Asia where the rural poor are frequently deficient in proteins and other nutrients whether or not they have enough carbohydrates. Silkworm pupae are full of protein. They also contain essential amino acids, potassium, calcium, sodium, magnesium, iron, copper, manganese, zinc, phosphorus, selenium and other trace elements as well as vitamins A, E, B1, B2 and carotene -- all of which are vital to the human body. 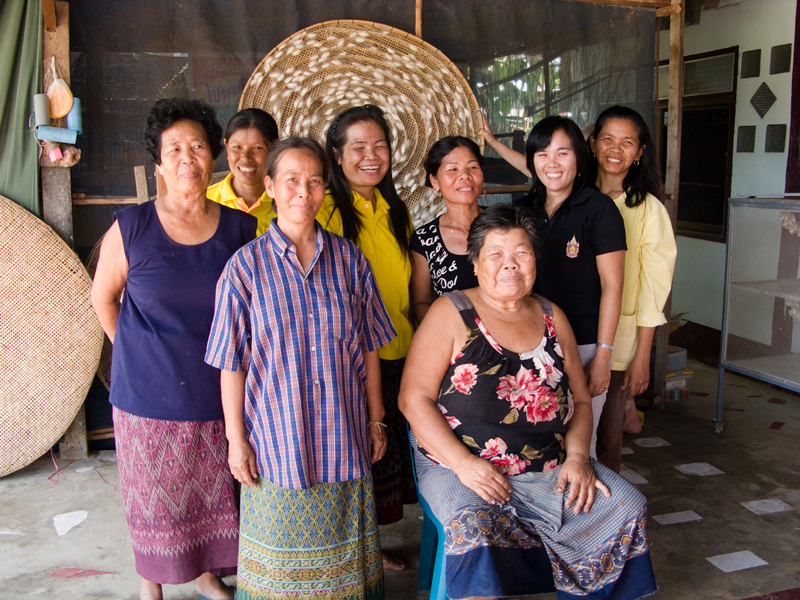 TAMMACHAT buys its silk from rural weaving groups in Thailand and Laos where women often raise silk caterpillars in their homes. These are Bombyx mori, sometimes called mulberry silkworms. During village visits, we’ve seen the boiled pupae relished as a traditional food. At TAMMACHAT, we put great importance on respecting the cultures in which we work. This often means leaving our judgments at home and, instead, trying to better understand the people who create the beautiful weavings we sell. So, when we were offered fried pupae, Ellen diplomatically tasted one. Later, I was delighted to see an FAO information booth at a fair in Vientiane, Laos, promoting the nutritional value of silk pupae and other insects. 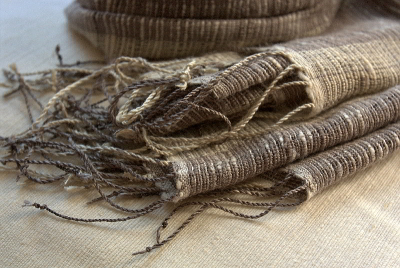 In India, there is another tradition of making silk from the remnants of cocoons made by Samia ricini, the Eri silkworm. Unlike Bombyx mori, the cocoons made by Eri caterpillars are not comprised of a continuous filament, so they are spun into a yarn rather than reeled as thread. Because of this difference, spinners can allow pupae to develop into moths that leave their cocoons. When the Eri silkworm was introduced into Thailand, however, women boiled the pupae anyway and added it to their families’ diets, maintaining tradition while providing nutrition. With this knowledge, I continue to wear silk just as I continue to eat eggs. In either case I ask: Were the beings that provided these things for me treated cruelly? Was the environment destroyed or depleted in the process? And most importantly, did the people who laboured to provide me these natural goods endure unhealthy or unjust conditions, or were they treated with respect and appropriately paid? We ask these same questions at TAMMACHAT Natural Textiles where our goal is to sustain cultures, communities and the environment rather than market what is sometimes called “peace silk,” “vegetarian silk,” “no-kill silk” or “cruelty-free silk.” We buy handwoven, heritage-quality silks coloured with traditional natural dyes. Our ethical fashion accessories and fabrics do not come from sweatshops or any other factory. Most of it is organic mulberry silk. 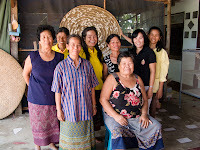 We have found only one producer in Thailand who allows the Eri moth to develop and leave the cocoons naturally, so his work is available in very limited editions. If you’d like to see these or our mulberry silks and learn more about how they’re made, we invite you to visit www.tammachat.com.